2008 Threads of the Day, Leids Wevershuis (Leiden Museum of Weaving), Leiden, The Netherlands. 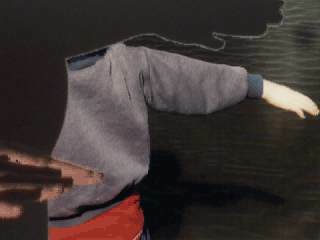 1999 Wall projection in SWIPE, PVA new media festival (PVA MediaLab) Bridport, U.K. 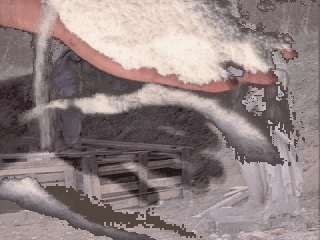 The 6 minute video Grains of Salt (1999) can play endlessly, just as the hands in the video seem to filter the salt endlessly. Sometimes this is installed as a continuous video projection. Other times it is shown on a monitor. 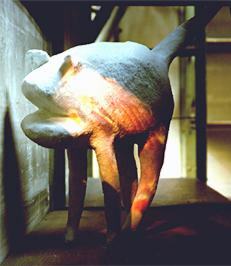 In the May 1999 (see image on the right) exhibition, this video was projected onto a curved salted surface (10 cm high). 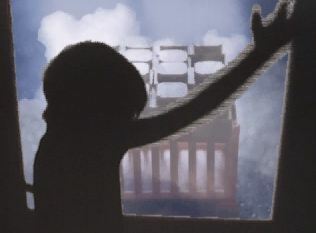 It was projected metres high where visitors' silhouettes threw shadows onto the projection as they passed by for the SWIPE festival in Bridport, U.K., in 1999. Watch a 1 min 36 sec excerpt on vimeo. This video is an extension from the performance "Making Salt" which was for the 1998 Inter Society for Electronic Arts Symposium (ISEA). In our information age, we are more conscious about filtering our information because we cannot possibly absorb it all. In some ways this is scary, because it means we have to make choices, while on the other hand there are choices to make. The 'actors' in this video are the 4 artists and 2 children who were involved in making the video. Generally you see our hands engaged in filtering or playing with salt in our hands. Most of the stills and moving images come from snapshots from the lives of the six of us. We took images out of our personal histories to serve as multi-layered backdrops for this theme on dealing with the information age.